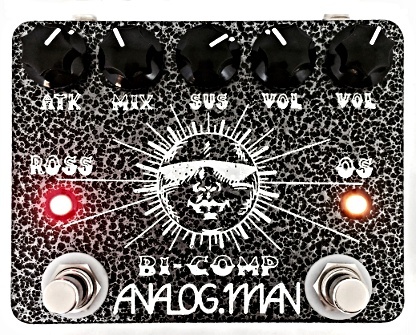 Comp Version*: REV5 new version with 5 knobs in a row, side jacks, add $25 [Add $25.00]Side Jacks are up beside the knobs on the 5 knob Bicomp. Power jack still on top. REV5 with external MIX knob, in Attack location (attack moved to internal trimpot)- on the old 4 knob case, we can put the ATTACK control (which is rarely adjusted) inside the pedal on a trimpot. Then we can put the MIX knob where the ATTACK knob normally goes. We may use a sticker over ATTACK or ATK and label it MIX. Add a Toggle Switch: Add RYCK toggle option $40 [Add $40.00]- Will not fit on Mini Bicomp with both ATK and MIX knobs. Optional toggle switch: Add high cut switch for Juicer side $35 [Add $35.00]This cuts the high end and reduces noise on the Juicer side. Stock setting plus a mild and deeper cut on the 3 position switch. Add a Power Supply: US 120V 12vDC $18 [Add $18.00]- This USA power supply will give 12V to the pedal instead of 9V, see the pedal description for more info on why you might like this. Switch Mod: P3 power mod $65 [Add $65.00]Allows using P3 power system, or normal (battery or power jack) for powering the pedal. Two mini toggles are added. Not available with 4-jack options. Modification: NOS 1979 RCA Compressor chip $5 [Add $5.00]We always use New Old Stock (NOS) CA3080E chips in our comps, I don't think any other well-known brands are still using them. They were made by RCA, then Harris, then Intersil as the company was renamed over the years. We have some original 1979 RCA CA3080E chips that I have been saving for years, so I am putting them up as an option. I don't think they sound much different, but they are the exact same ones used in the old grey Ross compressors so it's pretty cool to have one in your pedal. 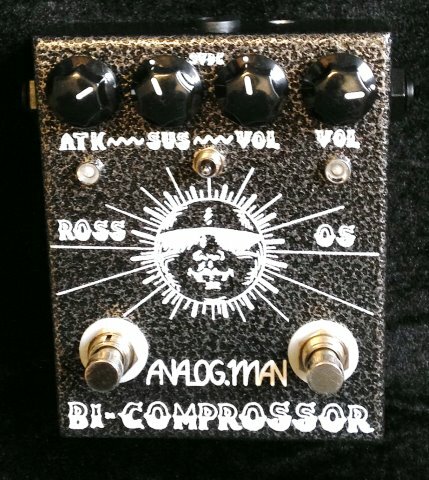 Analog Man presents - the Bi-Comprossor. 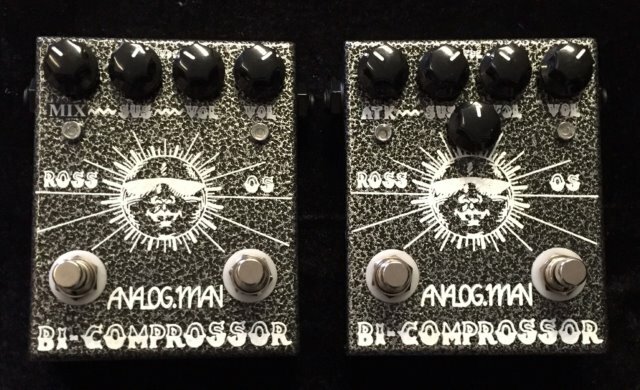 Two compressors in one pedal - an Analogman Juicer on one side and a Analogman Comprossor on the other. A MUST HAVE pedal!!! We have one rev3 with free 4 jack option, and one rev4 in stock. And REV5 is now available! We have a new 2017 version of the Bicomp with 5 knobs in a row (MIX and ATTACK knobs). They are wider than they are tall, like the KOT, switches are wider apart for easier stomping. We always use New Old Stock (NOS) CA3080E chips in our comps, I don't think any other well-known brands are still using them. We have some original 1979 RCA chips that I have been saving for years, so I am putting them up as an option. I don't think they sound much different, but they are the exact same ones used in the old grey Ross compressors so it's pretty cool to have one in your pedal. Rev5 circuit- MIX control available in 2016! In April, 2013 we came out with REV4, which improved the COMPROSSOR (left side of BICOMP) circuit. Mike had been playing in a band for a few years, and noticed that SOME pedals on his board would not drive a load well, they would get dark and dull, due to a bad (high) output impedance. This is easily tested by running pedals into something like a low impedance volume pedal, with a switchable buffer between them. The ARDX20 with the delay level down is excellent for testing - when ON it's a great buffer, when OFF it's true bypassed. To test a pedal, simply turn the buffer on and off and listen for a change in tone. With most pedals, like our Chorus, Juicer, etc, there is no difference - they can drive the signal to your amp through long cables or volume pedals no problem. But the Comprossor sounded dull when the buffer was removed. The original Ross, Dynacomp, and all the other Ross clones do the same exact thing- they really need a buffer after them to sound good. Also these pedals don't have a very loud output, especially when you hit them hard, for example with humbuckers or a boosted signal. One other problem all these pedals have is phase reversal - they flip the phase of your signal when you turn them ON. This may not be a problem for most people, but if you split your signal and combine it, or run into two amps, the out of phase signals will cancel and you will get a VERY thin sound. Also, for use as a clean boost, there was too much compression even with the SUSTAIN pot all the way down. So we reduced the minimum compression amount, without changing the maximum amount. Now the pedal is more usable as a clean boost, and also sounds great left on all the time as a tone sweetener/buffer. It's great stacked into dirt pedals, chorus, vibes, etc now. With these problems fixed, there is no need for a blend knob, you should be able to keep your pure tone without the need for additional circuitry. This is pretty much the same as REV4 with the addition of a MIX control, which can go from full dry (no compression) to full wet (same as REV4). Mixing in dry gives you the attack of the note, which is compressed away normally, if you want to hear that. When set at full dry, the pedal becomes a clean boost/buffer pedal and makes pedals after it sound really great, with more presence. Mix is available as a trimpot on the circuit board or as a fifth external knob above the sun logo on the old taller case or with 5 knobs in a row on the wider case. We can also put the MIX knob where the normal ATK knob was, on the old 4 knob box, and put the attack control as a trimpot on the board. Attack is subtle and not often adjusted. We also offer the USA 12V power supply for a little more headroom, good if you run a hot signal into the comp and highly recommended. The Dynacomp and Ross circuit is not very bright, to keep white noise down. But sometimes it's nice to have a bright trebly tone, as heard on Rickenbacker guitar's built-in compressor. Looking at the Rickenbacker schematic, it's about the same as the Dyna/Ross except it allows more treble for that jingle-jangle sound. We decided to offer this with a three-way switch so you can get just the amount of treble you want. One position is the normal Dynacomp/Ross value for the normal comp tone and low noise. The second position adds a bit more treble and just a touch of noise - this may be great to use all the time with a dark guitar like a Les Paul with high output pickups. The third position is twice as bright, close to the Rickenbacker setting, for a sound that really pops, with a bit of noise that you won't notice till you stop playing, if at all. We can put this toggle on any of our new CompROSSor or Dynacomp pedals when ordered, or we can add it later on which costs a bit more as it's more work to add it after the pedal is built.The Treble boost is only on the WET (compressed) sound of the REV5, the dry sound mixed in will be normal tone. I got the Bi-Comp in the mail, today. I’ve played around with it for a couple of hours, this evening, and I love it. Covers all of the bases, compression-wise, for me. I play Gretsches with Tv Jones Classics and Brian Setzer signature pickups, which sound great on their own, but I also play in a band where the other two guitarists play Telecasters, so it’s hard for me to cut through. I’ve tried the MXR Dyna Comp (block and reissue), and played a Janglebox the last two gigs. The Janglebox helped, but the Ross side of your compressor is what I’m looking forward to using at my next gig. Nice, loud and clear.....not squished like the others. I am having fun with the OS side and the Ryck switch, too. Best compressor I’ve ever owned...AND, been able to play in a band setting. Well done! These comments are for an earlier model that I bought in 2005. If I had to choose just one pedal to use with my bass, this would be it. Does exactly what I want it to, without taking anything away. The new revisions really must be exceedingly good! Received the BiComp last weekend and it opened up such a lot of new combinations! Sounds absolutely amazing with my Strats (especially the Juicer), Telly and ... thanks to Ryck! ... even with my SG and 335! Great Idea! Won't leave home without it! Somebody in another review said, he has never been so properly squeezed before! +1 from me! Thanks again, Mike! I was a fan of Keeley pedals for a long time but found their compressor did not work for me, I’ve sold most of them on eBay. I quite like Wampler pedals and got their Ego compressor which is quite nice. I’ve been trying to get a really good Rickenbacker Byrds tone for years and even the Janglebox (I bought 3) didn’t do it. I’ve spent $$$ and have lost my hair trying to get it. I bought your BiComp last month, just arrived, with the RYCK toggle switch, amazing, fantastic, thanks so much for your excellent service and fab pedal. I realize now that the Byrds tone has much to do with good compressors. Thanks to you, my Rickenbackers now sound like Rickenbackers. I’ll be back for more of your pedals sometime soon. Sorry for my bad english before! That Bi-Compressor is a well balanced Compressor. Low Noise. The Tones are rolling out very nice. You can hear every tone while playing. You never lose a tone. The right side sounds a little naughty ( German: frech) and will give you just the right compression and the right attack you need for that great Mark Knopfler tone. Very twangy! The left side will give you a very good Compression-Sound without pumping but with nice rolling tones. No tone is overemphasized. The attack is well balanced and has a good Range. The Box is looking very nice and was prepared very professionally. I am so happy, that I can work with this unit.